Data Protection Act 1998 & General Data Protection Regulations 2018 (“GDPR”) You do not need to register any information to use this website but if you choose to become acustomer of Bradleys Countrywide we need to collect your basic information such as name, address, contact number and email address. We will take appropriate technical and organisational precautions to secure your personal data and to prevent the loss, misuse or alteration of your personal data. We will store all your personal data on secure servers, personal computers and mobile devices, and in secure manual record - keeping systems. We may process your personal data that are provided in the course of the use of our services. This may include your business requirements, financial information, solicitor and third - party relationships pertinent to a legal agreement to purchase or sell a business. The source of the data is you. The data may be processed for the purposes of operating our website, providing our services, ensuring the security of our website and services, maintaining back - ups of our databases and communicating with you. The legal basis for this processing is consent. Our website may contain third party material, we exclude all liability for any illegality arising from or error, omission or inaccuracy in such material and we take no responsibility for such material. 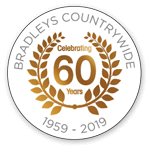 All photos and data remain the property of the Bradleys Countrywide and all copyrights acknowledged.